Upper fragment of cross shaft. 21cm (8.25'') in height, 28.5cm (11.25'') in width, and 8cm (3.2'') in depth. 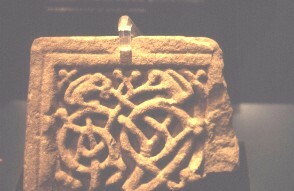 Upper fragment of cross shaft, dated to first half of the eighth century. This fragment has the remains of an inhabited scroll, with a double flat-band moulding forming the frame. The strands are thick, and terminate in small berry bunches. There are small quadrupeds in each corner. These have their tails turned over their backs and are gnawing the plant.